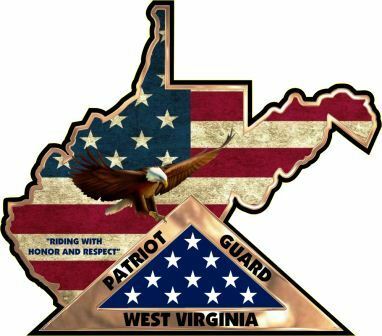 The Patriot Guard Riders have been invited stand a flag line for the start and finish of the 10k Wounded Warrior Run/2k Wounded Warrior Walk in Parkersburg, WV on Saturday, 22 Jun 13. Event will take place at Point Park (https://tinyurl.com/lxhjh3j). Staging will be at the North end of the parking lot at Point Park at 0700. Briefing will be at 0720 and flag line will be in place NLT 0745. Flag line will be maintained until the start of the race at 0800. We will return to also have a flag line at the event’s conclusion, approximately 0930. RCs Carl Spade (ace_gunsmith@hotmail.com) and Ron Dolly (rondolly01@gmail.com) are the Co-RCIC of this most honorable mission. Early weather forecast is a 30% chance of isolated thunderstorms with temperatures in the upper 80’s. Please dress and travel accordingly, ensuring you keep yourself well hydrated. If at all possible, please take a couple of hours out of your busy life as we honor and say “Thank You” to those who have given so much of themselves for OUR freedom and liberty.